Would you like to save up to 50% of your annual energy costs? With a regulated speed compressor we can help you to regulate your costs through efficient and reliable handling of the varying air requirements found in many plant air systems. 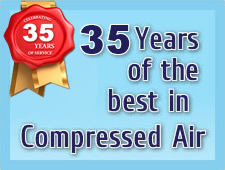 This type of compressor works by being able to match the amount of power required to the amount of air needed. By auditing your requirements we can ensure we match the right compressor to your application, and deliver you a constant air supply at a consistent pressure with the benefit of significant energy savings. Thank you for requesting more information regarding energy savings. We will be in touch shortly to discuss your requirements.